SS-Junkerschule Töltz, temporary arrest for SS Junker Ollman, feb 1945! 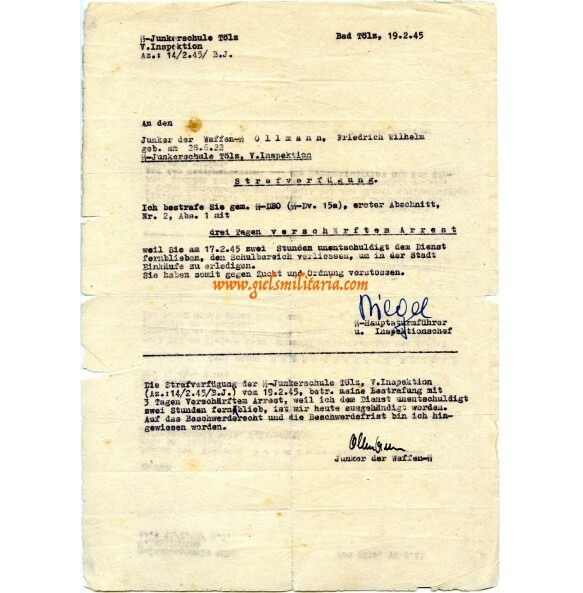 Temporary arrest document for SS Junker Friedrich Wilhelm Ollman, member of the Junkerschule Töltz in Bad Töltz. Ollmann received a small arrest of 3 days for being 2 hours late at service. Signed and agreed by Ollmann on the bottom. Signed by the SS-Hauptsturmführer and Inspektionschef of V. Inspektion. Document dates 19.2.45!!! A4 size with normal signs of age. A very rare original Junckerschule Töltz document! Top!